Rebekah Golden gave us a very informative presentation on foundationless beekeeping. Most common to top-bar or Warré hives, you can even go foundationless in Langstroth hives. 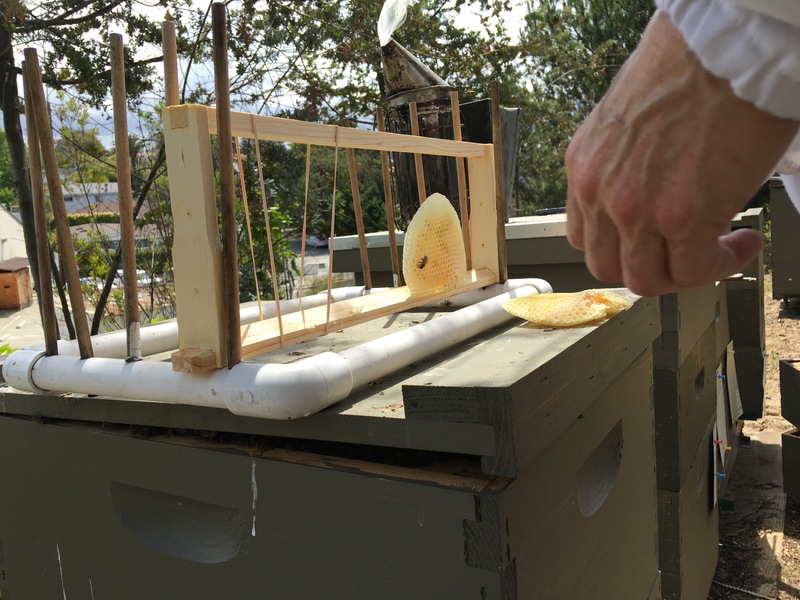 Here are some helpful tips for reattaching broken or crazy comb in a Langstroth hive. Photos courtesy Susan Rudnicki. 1. Broken or cross comb removed from frame. 2. Frame placed upside-down in holding fixture. 3. 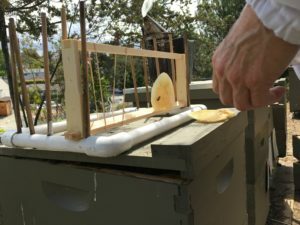 Comb placed upside-down in frame against “top” bar, and inside rubber bands. 4. 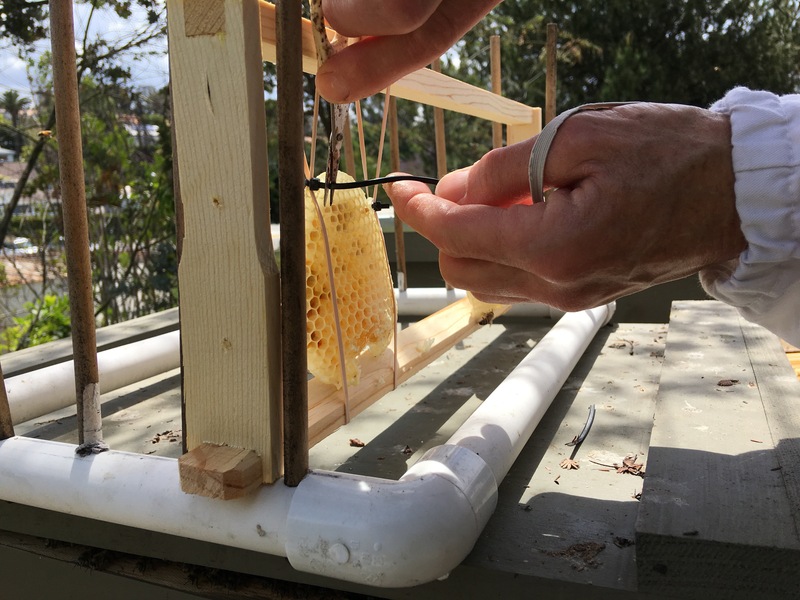 Zip-ties used to secure comb in place to keep it pinned against top bar. 6. Trim tails off zip-ties. 7. All done and ready to be returned to the hive. Andony Melathopoulos joined us again for our August meeting and gave us a great presentation on Living with Varroa. 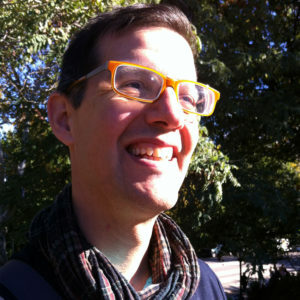 Andony is an Assistant Professor of Pollinator Health Extension in the Department of Horticulture at Oregon State University. His work at OSU comes out of a mandate from the Oregon Legislature to create a state-wide pollinator safety and outreach program. Prior to coming to OSU he was a Postdoctoral Scholar in the Department of Biology at the University of Calgary working with Shelley Hoover and Ralph Cartar on canola pollination. He holds an Interdisciplinary PhD from Dalhousie University (2015) and a Master of Pest Management from Simon Fraser University (1999). Formerly he worked as the chief technician in Agriculture and Agri-Food Canada’s Apiculture Research program (2000-2012). This month Dewey Caron shared information on dealing with swarms in May. Rebekah Golden was our featured speaker. She shared wonderful information on keeping native bees. Here’s Dewey Caron’s April 2017 presentation to the club. To participate in the survey, please visit PNWHoneyBeeSurvey.com. Dewey also provided us an excellent document on Dead Colony Forensics. At our January 2017 meeting our featured speaker was Andony Melathopoulos. 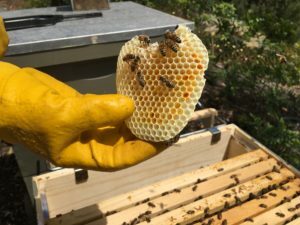 Now approaching his 47th year as a beekeeper, Morris, a retired biology instructor, says he learns something new every day about bees and beekeeping. Since 2010 Morris has participated in the development and implementation of the Oregon Master Beekeeper program. He is both a mentor and an instructor. 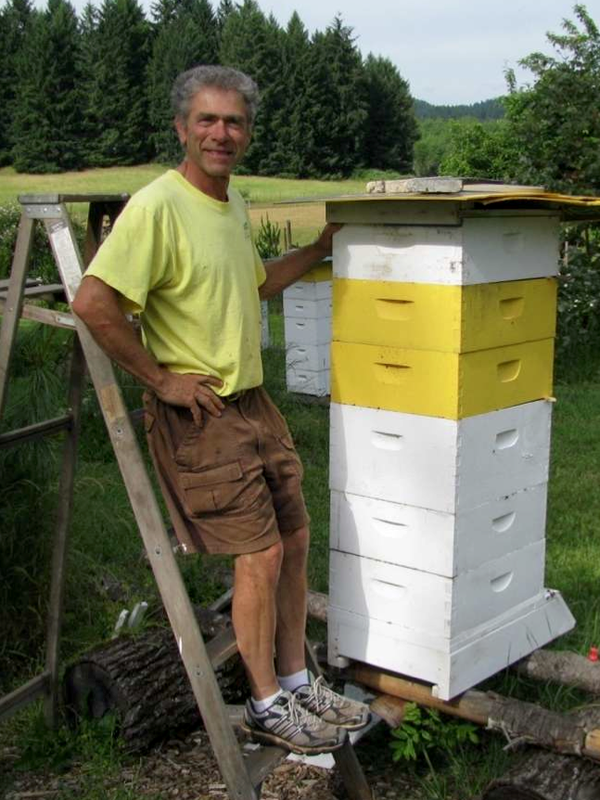 Morris is also an active member and past President of the Lane County Beekeepers Association. 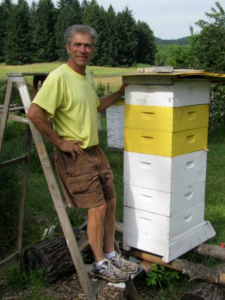 In October 2013 Morris was awarded the Washington state Master Beekeeper certification. He is the first Oregonian to receive this certification and is among only a half a dozen who currently hold this title. 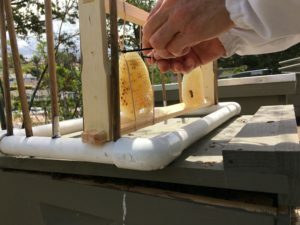 Morris is an occasional contributor to Bee Culture magazine; his last article, Glass Jar Beekeeping, appeared in the May 2012 issue. His newest article, Overcoming Barriers to Beekeeping: How to Continue Doing What You Love, appeared in the May and June 2015 issues of Bee Culture. Morris’ passion for teaching and beekeeping becomes apparent when he shares his knowledge with others. 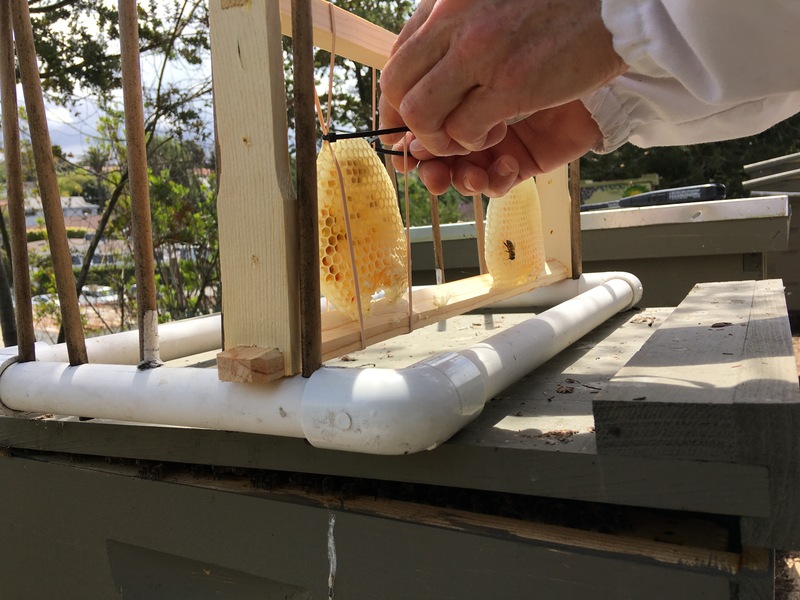 An interest in genetics and queen rearing has led to a quest to breed locally adapted, treatment free bees using the Miller Method. Catching swarms is fun, but chasing them down and gathering them up isn’t always an option for everyone. It’s so much easier to just let the swarms come to you as they move into a swarm trap. It can also be challenging to prevent our hives from swarming, so giving them an option to move into will make it much easier to catch our own swarms. I recommend reading Dr Tom Seeley’s book Honeybee Democracy where he writes up his experiments to better understand how bees choose a home. Within that book you’ll learn about ideal cavity size and entrances. The dimensions he gives are a cavity between 30 & 40 liters and an entrance no bigger than 15 square centimeters. 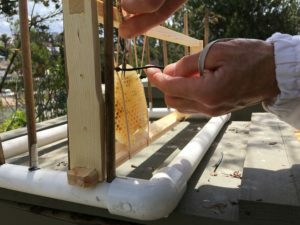 Some beekeeping supply store will sell you a “swarm trap” made of pressed fiber in the shape of a flowerpot. I really don’t recommend this option. Nobody has a hive that shape, so moving the bees from the flowerpot to the hive is tricky. Instead, use equipment that matches your hives. 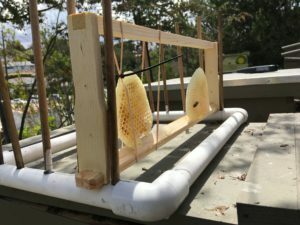 If you have a top bar hive, use a trap that has top bars that fit your hive. If you use Langstroth hives, use a deep (about 40 L) or a medium (about 30 L) with frames so you can easily move the frames from the trap to your hive without having to cut and string up comb. A 15 cm2 opening would be a hole with a 1.72″ diameter. So a hole anywhere between 1″ and 1.5″ would be perfect. For bait, a couple drops of lemongrass oil placed inside the hive, or on a cotton swab is just about all you need. You can also include some old brood comb for additional attractant. 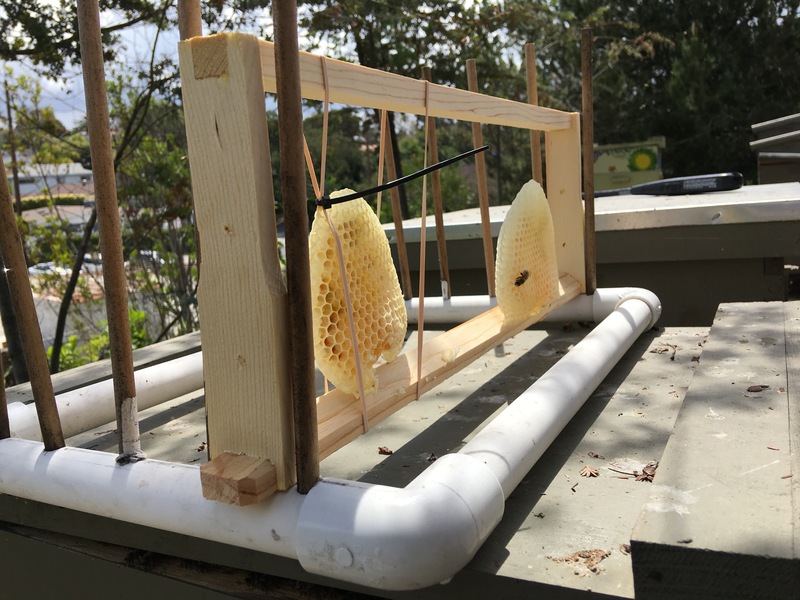 Sometimes bees will move into just about any old equipment, but by following the basic principles above, you can improve your odds of catching swarms the easy way. As Dr Dewey Caron mentioned at the meeting last night, June is a good time to get a baseline of your mite load. You may or may not be of the opinion to treat at this time. Or maybe you don’t want to treat at all, but knowing your mite counts and watching for the increase or decrease in the population may be important to you in other decisions you’ll be making. It’s also good information for diagnosing any problems you see or understanding the cause of death, should they not survive the winter. In the following video, Dr Caron demonstrates 2 ways to get a good count: the sugar roll and the alcohol wash. Sticky boards might be easier and less intrusive, but they don’t give a mite count that can be used for comparative analysis throughout the year. 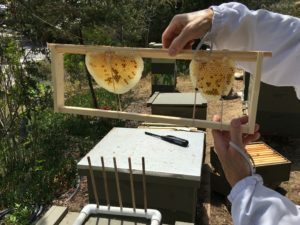 Bee population changes during the season and this can affect the sticky board counts. 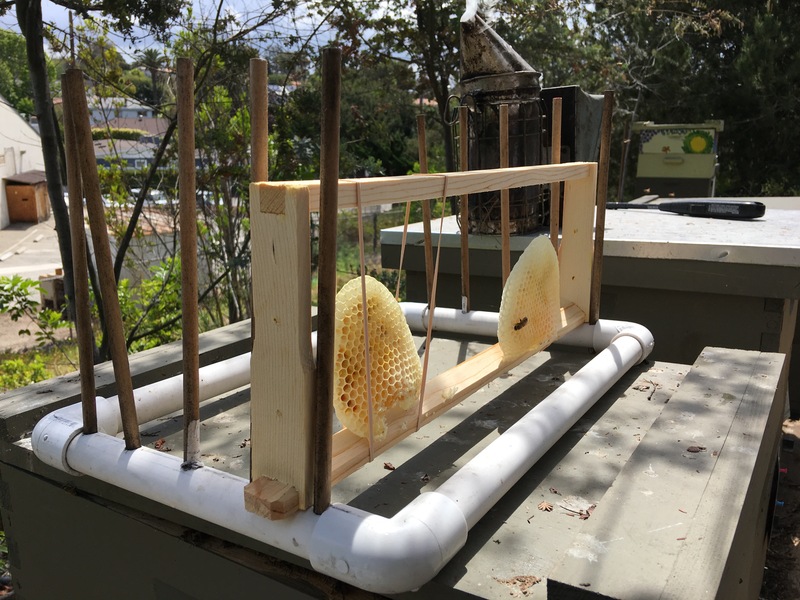 The sugar roll and alcohol wash give you a more reliable percentage, or number of mites per 100 bees.